When I was young, I didn’t really know who I was. I didn’t have many close friends, and had no passions to speak of. That all changed when I went to my first Drama Studio open house. For the first time, I walked in the door of a building and I felt like I fit there, like everything was right for once. I signed up for classes that same day. In my first year of classes here, I finally learned who I was and what that meant, and what I could bring to a theater— to the world— that no one else could. As I got older, I discovered through acting what life could be like in another person’s perspective, and it made me a better person. I learned how to interact with people effectively, because for this first time in years I felt comfortable enough to do it. I grew from this indistinctive blob of a person to a real human being, with thoughts and feelings and goals and passions and empathy. Not only that, the Studio gave me new talents and skills that I never thought I could have. I learned acting, stage managing, tech operation, and even dabbled in teaching and desk management. Now I do everything I can to spend more time here, and to give back some of the joy the Drama Studio has brought me. When I started the Drama Studio 7 years ago I didn't expect it to become such a big part of my life. I was scared to try anything new and the idea of being on stage scared me. I wasn't quite shy when I began, but I didn't really have any friends either. Over the many years at the Studio all of that changed. I began to look forward to going to class or rehearsal. I gained confidence and made friends. I learned how to solve problems, work as a group, and how to make my voice heard. One of my favorite memories I have is my first day of IDA (Intro to Dance for Actors). I came in not expecting much and definitely not expecting to be good at it! By the end of my first day, I knew I loved it. IDA was a class that when I started I never thought I would take, and it ended up being one of my favorites. Sometimes you do something you never expect to do and it turns out for the better. If you had asked that little kid 7 years ago if he would still be at the studio in 7 years, he probably would have told you "No" but he's sure glad he is! At ten years old, I was the kind of person that was apprehensive and nervous about nearly everything. At school, I was outcasted by many and I felt as though no one truly cared about me. I was a creative kid who felt as though she didn’t have a voice or a place to express herself. Then, as if by miracle, my mother found a place that was a half hour away from us, where I could perform and be the imaginative kid I had always been afraid to be. I was positive I wouldn’t be performing at the Studio for very long, and I was convinced it would do nothing for me. But of course, if my assumptions at 10 years old had been correct, I would not be writing this. The Drama Studio was the first place I had ever been in my life where I felt 110% accepted for who I was, and not someone I was trying to be. I found myself not trying to impress anyone which was completely new to me. I loved attending my class every Friday, and I found myself so eager to learn.I began to try new things, not just onstage, but in life. I became more outgoing and less concerned about what others thought. I felt important, loved, and supported by every individual at the Studio, and they all made me feel as though I possessed an undoubted purpose, not just as an actor, but as a human being. And they still remind me of this fact today. I will always be eternally grateful for Dan, Amelia, Mat, and Steve who have all inspired me in so many different ways. They have taught me to be fearless in my choices, given me the necessary confidence to be myself, and they have believed in my talent and expression. Lastly, the Drama Studio gave me some of the most amazing friends I could have possibly found. I met people that genuinely wanted the best for me, and they enjoyed watching me grow as an artist and person. For some, this place may just look like a theater conservatory. For me and many others, it’s what you would call a home. I am constantly learning something at this place, and if I didn’t reluctantly join at 10 years old, I truly do not know what I would have done or where I would be today. Happy. That word can make people think of a lot of different things. Maybe you think of that time that you and all your friends went out to eat. Or maybe you think of when you and your family went to Disney. I think of the Drama Studio. I can think back to a time before Drama Studio, and I can’t imagine myself as that person anymore. I was shy and a pest. I had one friend and I lived to annoy people. I never got caught by the teacher but all the kids avoided me. Then I joined the Drama Studio the summer after second grade. At first, I did what I did at school. I pushed people away by being annoying and then felt bad for myself. Except it didn’t work. I pushed people away and they kept coming back. I decided to open up and made some very good friends. I found a support net. I knew if I fell off a cliff that net would be there to catch me. I can’t imagine my life without the Drama Studio and I don’t want to. I know that, no matter what, I can walk into that place and I will have someone willing to listen and help. Drama Studio is the highpoint of my day, and it always makes me happy. When I went back to school in third grade it was so different. People expected me to be a pest, but I didn’t want to be. I had changed a lot and I made several wonderful friends. The acting part of the Drama Studio makes it even better. It brings you closer to other people and forms this special bond between you. There is no way I could survive without the Drama Studio. It is easily the best part of my life. I decided to enroll my son in a week-long camp at The Drama Studio. We had tried soccer, basketball, baseball, art classes, music together, book clubs, swim team, and writing classes. He’s a bright kid, not very athletic - but social. He’s definitely not your typical boy. I always worried. Mostly about social stuff as he got older - most of his friends were girls. He loved animals and playing pretend. He and his friends would put on little shows and he was always the one in sparkly wings and a crown. He loved Disney princesses - always fighting with his younger sister about who was the lead in the sing-a-long video. This little boy was delightful and I was afraid life would squish it right out of him. I signed him up for a musical theater camp during April vacation. He was 9. He has always been outgoing with his familiars, but shy in new groups. I could not believe my ears when I was told he had volunteered to sing a solo at the end of the week. He skipped out of camp every day with a smile and a wave to his new friends and teachers; his new tribe. He had found, at age 9, a place where he was celebrated for exactly who he was - a place where he felt valued and a part of something bigger. A place where he contributed and everyone - from Janet behind the desk - to Greta who assured us his costume would never itch - showed that he was important to them. Isn’t he lucky? Raising kids in this digital age is hard. Kids disappear into screens and can’t seem to participate in conversations - not Drama Studio kids. These kids learn to navigate the waters of social situations. They get to try out different characters and personas in a safe space before seeing how they might feel in real life. These kids are encouraged to draw from their everyday and take it out - those emotions - explore them. So many adolescents are trying to figure out who they are, who they want to be. The Tile Room and the Black Box, the Dungeon - these places are spaces where kids grow up - without ridicule. Aren’t they lucky? Just like my son...all of these kids find their tribes. I worry a lot less. I see the love and acceptance in every show, at every sharing. I knew, and know still - he has a place that is stable - a place that can be a second home. Now, I am the proud parent of 3 students all enrolled in classes. I can see how my middle schooler tiptoes through the sixth-grade halls of her school yet she heads through that red door with sure feet. I feel lucky. Lucky to have stumbled into The Drama Studio 6 years ago, at exactly the right time. My story, Julia’s “Day One Drama Studio Story” began with a bit of good fortune. We had occasion to sit behind Amelia at Trinity Church Christmas 2008. From there, we heard about The Drama Studio and Julia attended a summer session in 2009, “Butterfly Camp.” She loved Amelia (don’t we all? ), her classmates, the setting and really related to a character “Chrysalis” she played — a butterfly breaking out of her shell at a new school. What a perfect metaphor for Julia as she was going to start middle school. As a parent I was thrilled for her joy, and soon discovered this hidden gene I had for loving theater. Thank you to Julia and our Drama Studio staff for that. She had discovered her activity — truly, a life-changing activity. The analogy of the “butterfly hatching from its chrysalis” is a great way to describe the transformation I have seen not only as a parent of Julia but also as a parent watching this play out with so many Drama Studio students. I am proud of Julia and every child/person connected with The Drama Studio! In 2016, my friend Elise told me about acting classes she took at this “cool acting studio.” At first I was hesitant, but after she told me about the amazing staff, I attended my first class in January! I immediately loved it! She was right about the amazing staff – Amelia is so kind and supportive of what I want to achieve as an actor! I always tell my friends about Drama Studio and how awesome it is, and some joined! Right now I’m in my second year at the DS and I’m taking YAP, and loving it! So far I feel like the Drama Studio is my second home, and I hope newcomers feel the same way! Our son, Zach, attended the Drama Studio for nine years, from the age of nine, through high school graduation. Zach was not what most people would consider a “mainstream” kid in school. He had very little interest in playing sports, and his peers sometimes had difficulty relating to his high energy personality. Clearly, he needed an outlet. We decided to sign Zach up for Summer Scene when he was nine. He seemed excited to attend, but then he tried to back out at the last minute. We weren’t letting that happen! And thank goodness we didn’t - because Zach never looked back. Although Zach didn’t become one of the superstars of the Drama Studio, he was made to feel like one, and he always felt welcome and very comfortable being himself when he was there. By embracing each student’s unique qualities, the Drama Studio creates an atmosphere where the kids form bonds with each other, and long friendships. In addition to this extremely valuable boost in self-esteem, Zach also developed very important social skills. We’ll always be grateful to the Drama Studio for being a place where Zach eventually appreciated who he is. I'll never forget what is probably my best audition to this day. I used to be scared of trying new and outgoing things, and auditioning was terrifying. That audition was my first real acting choice I felt I had made on my own. I almost took Steve Hays' head off with a shoe. I left feeling so scared that I had sealed my fate of not getting a part. But I got a part—a good one. That experience has definitely taught me that it's okay to try new things, and even if something seems wrong (like throwing shoes around) it's better to make a strong choice, than to not make one at all, which is a hard concept to apply to real life. To this day, I'm always trying new things. It has made me a better actor, and a more confident, outgoing person. When I started at the Drama Studio, I was pretty apathetic about most things I did. I wasn't doing well at school, because I didn't do homework, and I didn't care. My frustrated parents couldn't find a way to get me involved in keeping my grades up. There was no reward they could offer and no punishment that hit home—until I started at the Drama Studio. When my parents told me that failing a class at school meant I couldn't go to class at the Studio, I had my first real incentive to pay attention to the letters on my report card. For the first time, being grounded had real weight; it meant that I would be kept home from the Studio, and that was something I couldn't risk. So, I started working to improve my grades in order to ensure that I could keep going to my new favorite place on earth. My grades did not immediately become perfect, and homework never became my favorite thing. But I spent high school as an honors student, and ended it with above a 4.0 GPA. And—what was most important to me—I got to stay a student at the Drama Studio. My experience at the Drama Studio has been amazing. It has created a judgment-free zone that so many kids could work in and be comfortable working around different people! It is an amazing experience being able to be who you never thought you could be. Improv Technique with Dan Morbyrne allowed me to be as creative and thoughtful as I wanted, and that's something I really appreciate. When I was younger I struggled severely with self-confidence at school. When I had a school project, I often was terrified. Not only to present it in front of people of whom I was afraid, but even to carry my poster down the hallway, because it meant more people would be looking at me. I didn't even know how to walk up to someone and say hi without wanting to throw up. 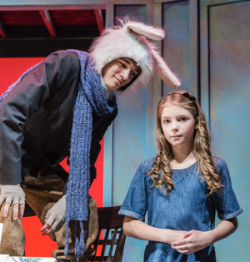 The Drama Studio curriculum is an incredibly unique program because it has the ability to pull kids out of their shells without making them feel uncomfortable. Now, being 15, and a longtime student at the Drama Studio, I feel free to raise my hand in class or talk in front of a large group of people. But more than that, the Drama Studio taught me who I am, and the person that I want to be. It gave me a family; meaning I got people who wouldn't ever let anybody hurt me. And that is a debt I will never be able to repay. Every art begins with a teacher. The teachers here at The Drama Studio have been the best I could have ever dreamed of. They have inspired me to further my passion in theater since I was very young, and I knew in my heart that theater was the profession I wanted to go into. I was lucky enough to learn the skills I need to go into the adult theater world from five smart, professional, and talented teachers through the time I have spent at the Studio. From Amelia’s Aesops Improv to Dan’s Shakespeare, I have been able to train in a wide variety of theater. Performing on stage has had such a profound influence on my life and has molded me into the woman I am today. My teachers have been able to watch me grow into an adult. This was an invaluable resource in my training because they knew who I was and could work with me on a more personal level. I feel like I have grown up with the teachers I’ve met and they have become my role models and also my friends. Seeing the creativity flow through these adults has enlightened me to wanting to become a theater teacher myself. Next year I will major in Theater Education and Acting at Emerson College, which is my dream major because it’s everything I want to learn about. In theater, you could take a million classes and there would still be more to learn. I know I have more to learn, but I am lucky enough to have such a strong base knowledge of the theater to support me in my further studies. I hope that wherever life takes me I will have acting as a part of my life. I also hope to give other children the amazing experience I have had in theater because I believe it’s extremely beneficial in helping children discover who they are. I will always remember my teachers at the Drama Studio for being the first to show me what I am capable of in this art, and also who I am. I cannot thank them enough for what they have taught me onstage and off. Working specifically as stage manager has helped me grow as an actor and in my everyday life. It was a challenging but very rewarding experience. I learned the value of organization, being on time, and respect. Having so many people rely on you is incredible, but also very scary. I knew that if I messed up, I would be messing things up, not only for myself, but for the entire cast. Having that kind of control made me feel even more eager to succeed. It is so amazing to have a place like the Drama Studio where young people can have so much control over the shows we put on. It is very empowering and makes me feel like I can take on anything in the world. When I was eleven years old I took my very first Drama Studio summer camp with Amelia, “Butterfly Camp,” where we explored scenes that were inspired by butterflies. I began the camp as a relatively shy soon-to-be-sixth-grader but right away I made friends and felt like I fit in. One of the aspects of this camp that left a lasting impression on me was a scene that I performed in about a girl named Chrysalis “breaking out of her shell,” so to speak, at her new school. Not only was the scene a metaphor for the stage in a butterfly’s life cycle, but it felt like a representation of me in a way. This was my first time acting on stage and it was a life-changing experience, seeing as now acting is something I would like to do throughout my whole life. I’ve enjoyed every class I’ve taken at the Drama Studio since then and I know I will cherish every minute I have left until 2016 when I graduate. Through it all, I can never express just how much Amelia’s encouragement to try new things and her enthusiasm about everything at the Studio has meant to me. In the short time I have spent at the Drama Studio, I have learned a lot more than anyone would ever expect. I have learned a great deal of responsibility, how to be a lot more organized, and the Drama Studio has helped me to be more open-minded. I love all of the staff there, and appreciate everything they've done for me and all of the students, past and present. Now, my Studio story. When I first started at the Studio, before I had the privilege to be instructed by Dan Morbyrne, he gave some students, including myself, a piece of helpful advice. He said, "You have to be willing to fail in order to succeed.” There is so much truth and power in one statement. That one piece of advice has been ever so helpful to me in every aspect of my life. Be it theatre, school, or wherever. I thank Dan for that, and thank the Drama Studio staff, and students for being super-awesome. Your help is immeasurable. The Drama Studio. Wow. This place has absolutely changed my life. First off, every single Friday of 2011-2012, I would find myself saying to my mom "I can't wait to go to 201 today!" And that was hard for me to say of something I did outside of school because I had never had that feeling about anything before. And I still find myself saying that about all my classes. All of the teachers here have inspired me to be myself. The Studio is the only place where I can be myself and not get judged. It's my private world. In Character Work, I learned how to make my own character by using examples and feelings from everyday life. In Q&A, I learned that a scene could be completely composed of questions and still make sense. In Musical Theater, I learned to act while singing and I learned even more about the earliest days of music. Honestly, my biggest fear at the moment is that when I'm like 15, I'll want to leave the Studio. I like to call the Studio my second home and I thank everyone, friends and teachers who I like to call family, for making it my home. And I hope every time I see that big sign on that metal fence from now ‘til I'm 18 that I am filled with the happiness that I feel right now at 13. My experiences have shown me that people of all sizes, ages, and personalities can express themselves through dance, and that sometimes communicating with your body can speak more than words. These realizations have helped me grow so much as a theatre student with a clear, artistic vision. Thank you for that, Amelia! Steve Hays taught me to be brave and believe in myself. When I took musical theatre classes with him he taught me how to sing loudly and proudly. He pushed me to do things that I thought were challenging and scary, that I thought I couldn't do. He taught me to question self-doubt, and I still use that lesson today when creating performance art. I'll never forget working with him and always think of him as the best teacher I've ever had. The Shakespeare class I took with Derron Wood at the Drama Studio transformed the way I view the master playwright. While we covered Romeo and Juliet in high school, I did not enjoy hearing it read aloud by bored, impatient students. At the Studio, however, Shakespeare came alive. We studied monologues and scenes intensely, understanding every word and the context surrounding it. Then, we acted—granting these classics the emotional intensity they deserve. Years later, giving an oral presentation in college feels like nothing compared to the opening chorus monologue from Henry V. A thousand thanks! 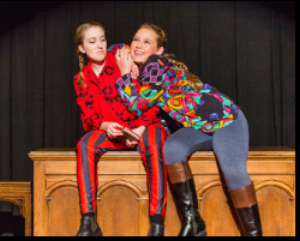 The Drama Studio has been a life changing experience for me. Not only have I met some of my best friends, but I have learned things that have helped me in life. Amelia taught me many things. One time that I can't forget was in Cabaret. I had a lot of lines, and was very nervous. The year before she got me over my stage fright, and she knew she would get me through this. She practiced with me, and gave me so much confidence. Amelia is the best teacher I have. So thank you, Amelia for helping me with my fears. Until I graduate in 2019 from high school and my second home, I hope to keep having many more memories with her along with the rest of the Drama Studio family. Thank you for changing my life. One part of going to the Drama Studio that I feel really captures my experience is that there is the passing on of knowledge. When you’re at the Studio, everywhere you look someone is teaching something. It can be as obvious as a method in a classroom or as simple as showing someone where the ladder to the catwalk is. The Drama Studio is a place of showing, learning, teaching, and growing. The clearest example I have of this is my experience in the Stage Combat class. I walked in on my first day, my fifteenth birthday, and I can still remember everything about it. I was late, had no idea what I was doing, and dressed incorrectly. I still remember the girl, who would later become one of my best friends in the world looking at me and saying, “That’s the last time you’ll wear jeans to Combat.” Unprepared as I was, I jumped right in and started learning the moves. By the end of the day, I had the beginning of a fight choreographed and couldn’t wait for the next class to finish my fight. Flash forward four years to a nineteen-year-old Brigid who was in Stage Combat throughout almost all of high school, went to college, and came back on winter break to help out with one of Dan’s combat classes. I stood there, on the grey floor of the dungeon, remembering all of my best Drama Studio memories while helping demonstrate a sword-fighting advance to his newest Combat students. I watched them learn eagerly and even got to show them a few tricks of my own. As I explained to them that the sound your swords make when they hit each other tells you whether the tension in your arm is correct, I saw myself as a part of the wonderful process of the Studio. I had spent my years there learning and growing, and now I got a chance to teach, even in a simple little way, while watching students learn a little in front of me. I am thankful for everything that the Drama Studio has taught me, and I hope every student gets their chance to appreciate and be a part of this process of learning too. The first play I ever performed in was the Tempest in 2000. I was 12 years old, and this was the first time that I ever felt like I was a member of a community. There was a massive cast, with some kids my age, and some who were in high school (and at age 12, those seemed like venerable, well-traveled explorers), and everyone was so friendly and welcoming. I was happy and proud to be in that community. I remember signing my name on the wall in the tech booth, where other Drama Studio alum HUNDREDS of years ago had also signed their names and drawn fascinating images that related to their time here. It was something that felt so much bigger and more important than me, and now I was some part of it. Fostering that sense of community is something that still drives the sort of work that I do, and I am honored to have found it at the Drama Studio. One of the main things I gained at the Drama Studio was friends, and a new perspective on life. I’ve always had difficulty making and keeping friends, so when I went to the Drama Studio, I had a feeling I'd end up dropping out for that reason. Fortunately, I met all these wonderful, marvelous people who have helped mold me into the person I am today. Also at the Drama Studio, I gained such a new way of looking at life. The Drama Studio has taught me to take risks, look at things in a different perspective, and above all, love my way of living a little more. For that, I thank them. What was no doubt the most memorable experience of my time at The Drama Studio was performing in Blanca Flor, directed by the wonderful and always enthusiastic Dan Morbyrne. We traveled with the play to elementary schools in the greater Springfield area and performed for the students, who ranged from kindergarten to middle school. Let me tell you, there is absolutely nothing like performing for young children. Every reaction is 100% genuine and no feeling is held back. When the villain entered there were boos and hisses. When the heroes asked a question, answers were shouted back at him with everything they had. And daresay when the lovers kissed, there was everything from cries of delight to shrieks of horror. It is such a pure form of theatre; the audience is right there with you from start to finish. As I grow older and am privy to the more chaotic business side of theatre, Blanca Flor is a nice reminder that all you really need is someone who shrieks when the villain enters. Training at the Drama Studio has been a wonderful experience for me. I get to train with a fantastic staff who help me learn new elements of acting that I wouldn’t get at any other conservatory for the fine arts. The Drama Studio has given me the chance to be a part of incredible plays—this has allowed me to meet new people and make lifelong friends. Being a student at the Drama Studio has changed my life for the better because I’m now able to feel more confident as an actor and as a person. What do I like about the Drama Studio? EVERYTHING!!! Of all my years being here, even if it has only been three, I’ve made lots of close friends of all ages, from a sweet little 9-year-old to a soon-to-be high school graduate. Everybody just acts like we are one close family, no matter who you are. The Drama Studio, to me, is a home away from home with a huge family inside. That’s why I love the Drama Studio. After spending 9 years and 6 days a week at the same place with the same people, that environment is bound to have a major impact on a young child's life. The impact for me at the Drama Studio was amazingly, positively forceful. So many factors contribute to the influence of the Drama Studio on my life, but one of my favorites was the ICW class that I took for 8 of the 9 years. It was this class that taught me movement in my body, and the creative possibilities of the theater. Every year we had the support of the Studio to try something unique, such as using ropes onstage, using 4-foot wooden poles, using a large wooden structure, and one semester we worked exclusively with light. Having the space to play around in dancing with other people, and not just learning choreography and performing it, allowed me the chance to grow creatively and expand, and figure out who I was in the world because it gave me a place to belong, especially under Amelia's direction. Amelia is one of the most incredible teachers I have ever met, and continues to share her knowledge with kids today. My niece is now at the Drama Studio, and I can’t think of a more safe, supportive environment for her to continue to grow up in and figure out who she is and will become. Thank you to all who contribute to the DS and allow it to continue to change the lives of kids in Western MA!